Kanazawa is a medium-sized town on the "other" side of Japan, facing the Sea of Japan. It's a historic castle town, a ski resort in winter, and close to the beach in summer. More importantly for me, it's also the Japanese location for Eurocentres, a language school that specializes in immersion learning, including homestay with a Japanese family. I spent two weeks there in May 2004 as one of the 28 students in the Eurocentres program. The panorama below gives you a pretty good sense of what Kanazawa is like. It's a very different experience than being in Tokyo, Osaka, or the large Japanese cities where most Japanese live. Click on the image for a QT VR verison. 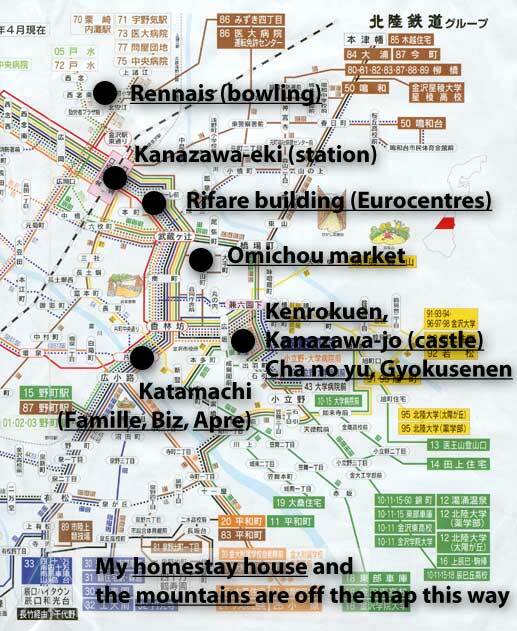 The map at right links to my pages about my time in Kanazawa, as do the links below. To tour all the pages, you can click on the first one below and then keep hitting the 'next' links at the bottom of each page. The bus map in the background at right is copyright Kanazawa city government. It also gives you a good idea of how developed the bus system in even a small city like Kanazawa is. For a sense of scale, it took about 15 minutes to walk from the Rifare building to Katamachi. My homestay house (not shown on map) was 20-25 min. by bicycle from Rifare. 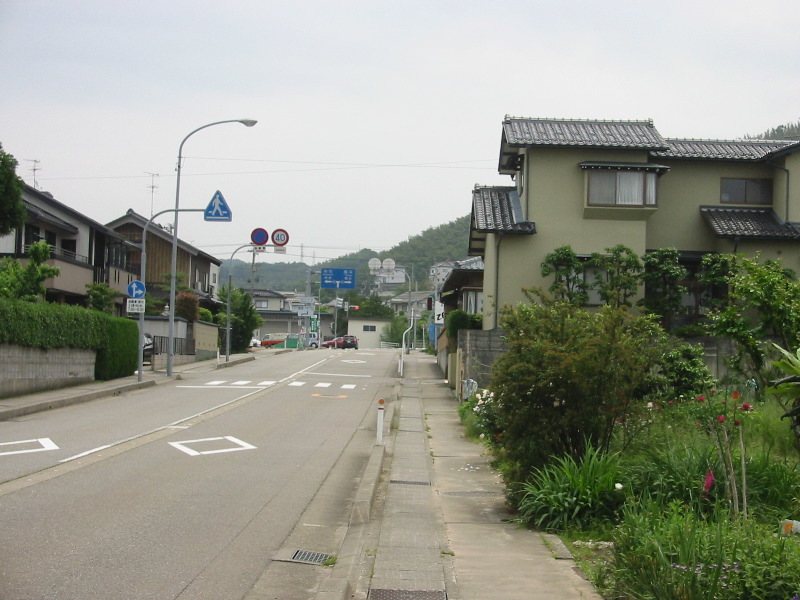 At left: a typical Kanazawa street. This was my path in to school every day. For more information about living in Kanazawa and Ishikawa prefecture, visit the extensive English-lanugage website run by the city of Kanazawa.